ISLAMABAD, Feb 10 (APP):The Prime Minister and Chief Justice of Pakistan Diamer Bhasha and Mohmand Dam Fund has so far received Rs 9.6957 billion.The countrywide contribution to the fund stood at Rs 8.332 billion while the remaining Rs 1.364 billion were contributed by the expatriate Pakistanis,according to an update issued by the State Bank of Pakistan (SBP).Pakistanis living in USA remained the top among the foreign countries who donated Rs 462.6346 million followed by UK from where a sum of Rs 351.419 million had been transferred to the dams fund so far. Similarly,the fund also received Rs 137.59 million through the SMS service of various cellular companies in Pakistan. According to details issued by the SBP, the top ten institutional donors include Employees of government of Punjab with contribution of Rs 1.09 billion, Pak Army Rs 582.071 million, HQ CWO SPD Rs 201.093 million, Bahria Town, Rs 110.12 million and PAF with Rs 100.28 million. 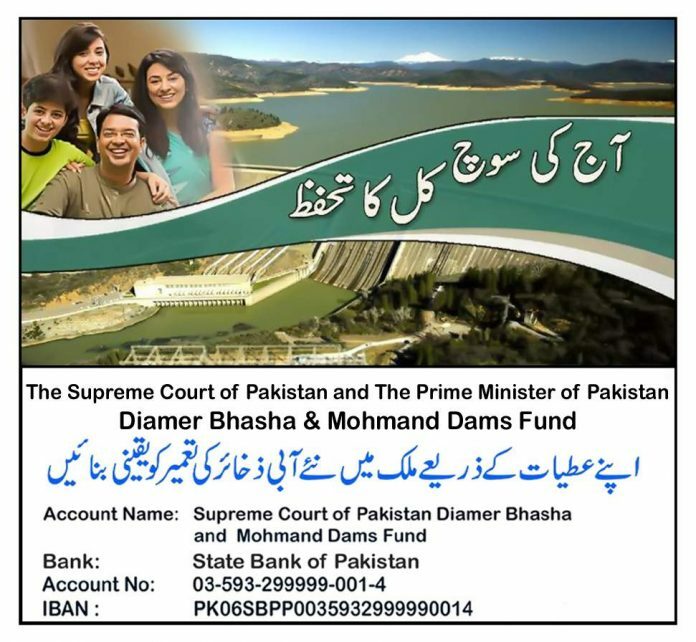 The Chief Justice of Supreme Court of Pakistan established a Supreme Court of Pakistan Diamer Bhasha and Mohmand Dams Fund on July 10, 2018 to raise funds for the construction of Diamer Bhasha and Mohmand Dams.The Court supervises the Fund and its Registrar operates its account directly. Later, the Prime Minister of Pakistan announced to join efforts with the Chief Justice of Pakistan for this cause. Accordingly, the fund was renamed as “Prime Minister and Chief Justice of Pakistan Fund for Diamer Bhasha and Mohmand Dam.